In a small mixing bowl, beat cream cheese and Nutella until smooth. Lay one sheet of phyllo on a work surface (cover other sheets with plastic wrap and a lightly damp towel). Spray sheet lightly with nonstick spray. Place second sheet on top and spray lightly with nonstick spray. Place third sheet on top and spray with nonstick spray. Cut sheets crosswise into 4 rectangles. Place 1 tablespoon of filling about 1 inch from the end of each rectangle. Fold the end over the filling at a 45° angle. Continue folding to form a triangle that encloses the filling until you reach the end (similar to folding a flag). Place on a parchment lined baking sheet. Repeat with remaining sheets of phyllo and filling. 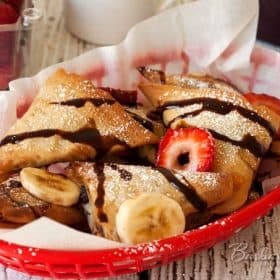 Serve dusted with powdered sugar, and topped with bananas, strawberries, and chocolate syrup.